We’ve all seen the traditional crockpots so I won’t bore you with those. 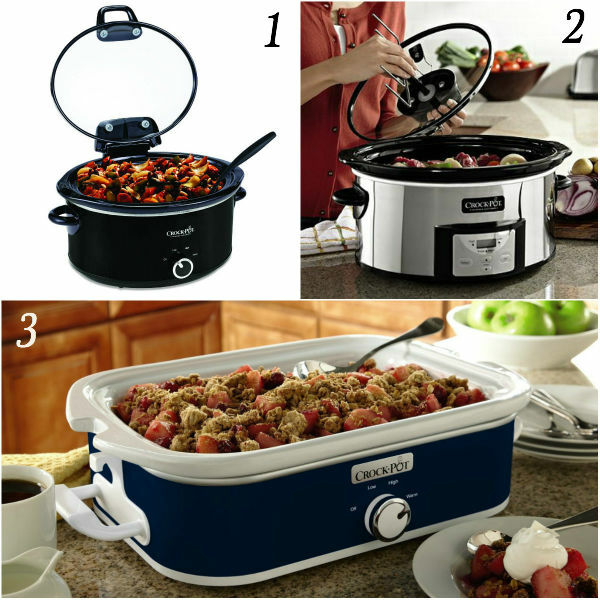 Whether you’re in the market for a new crockpot or are looking for a few accessories for yours, you’ve come to the right place! So sit back and enjoy the show! 1. 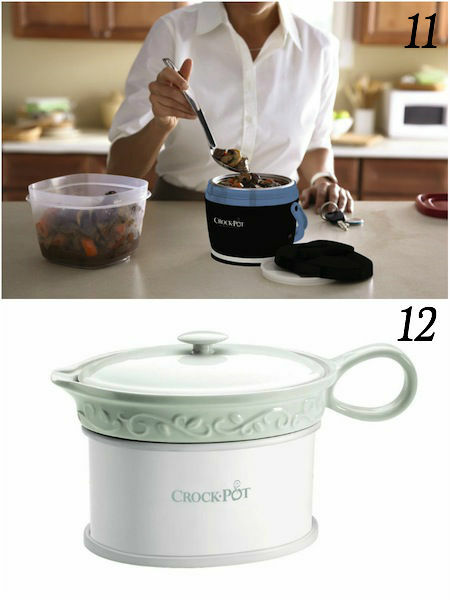 Crock-Pot Cooker with Hinged Lid – When you’re ready to serve the hinged lid of this crock will stay up for easy serving. But when you’re ready to clean the lid detaches for easy clean-up. 2. 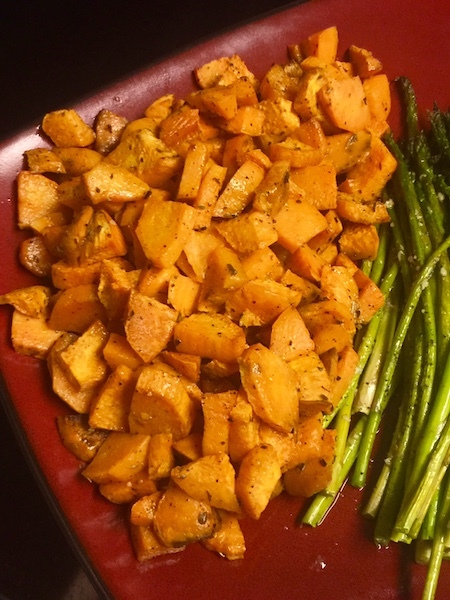 Crock-Pot Digital Slow Cooker with iStir Automatic Stirring System – Let the crockpot do the stirring for you so that you can serve your dish with confidence. Fun facts about this crock are the two stirring paddles (general purpose and stew paddle), removable classic lid handle, and it will automatically shift to the warm setting when cooking is complete. 3. 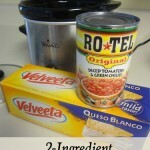 Crock-Pot Casserole Crock Slow Cooker – Casserole lovers will swoon over this crockpot. Not only does it have manual, high and low settings but you’ll easily be able to transport with its cook and carry locking lid system. 4. Crock-Pot Cook and Carry Cooker with Digital Control – Make transporting your crockpot super easy with this cooker. Not only does it have a secure fit locking lid system but it also has a cord wrap for even more convenience. 5. 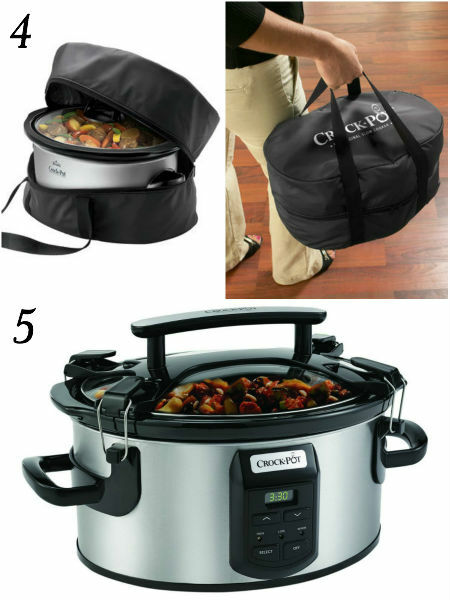 Insulated Crock-Pot Oval Slow Cooker Travel Bag – Transport and keep your meal warm with this carry bag. 6. Crock-Pot Double Dipper Warmer Slow Cooker – Warm two dips (or dishes) at once with the two 16 oz compartments on this cooker. 7. Crock-Pot Little Triple Dipper – Not only does this cooker give you the capability to warm three dips (or dishes) with its 16 oz compartments, but you can also easily transport it to your next party or family get-together. 8. 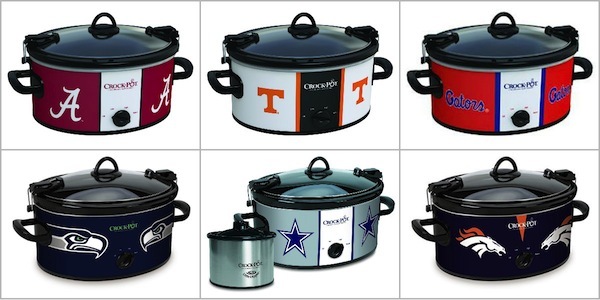 Support your favorite team with a Collegiate Crockpot or NFL Crockpot! 9. 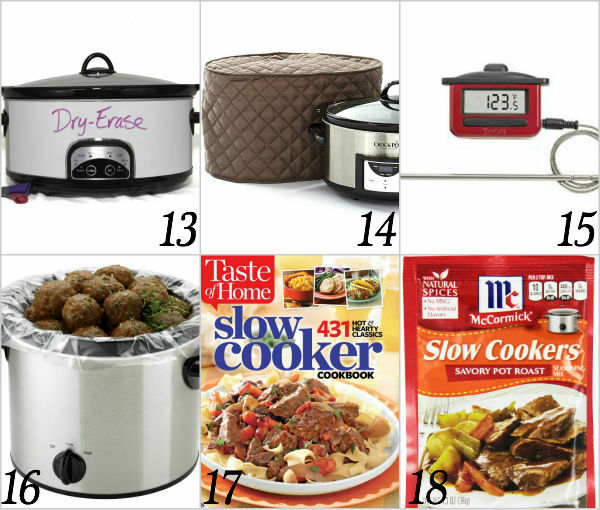 Bella Triple Slow Cooker w/Lid Rest – This space saving crockpot is perfect for buffets. Along with lid rests for each cooker there are also individual temperature controls. 10. 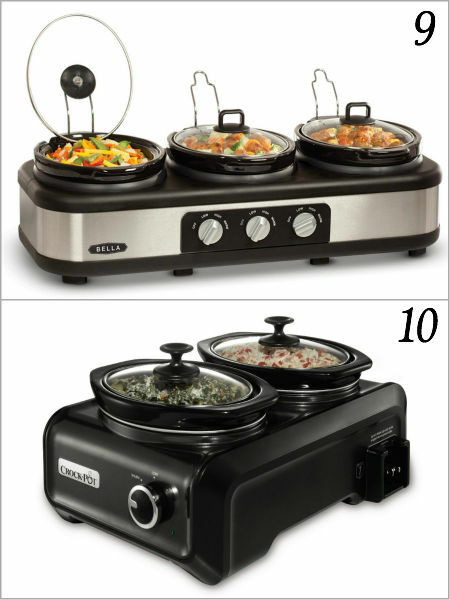 Crock-Pot Connectable Entertaining System – This cooker has a special cord that pulls out to use with standard outlets or stores inside the base to connect multiple units in the Connectable Entertaining System. 11. 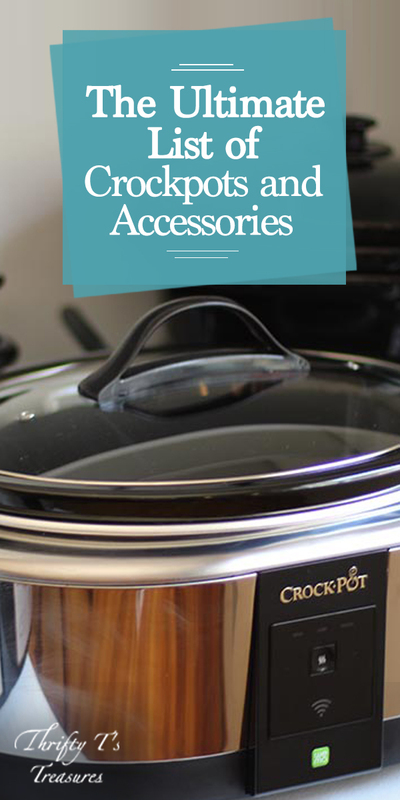 Crock-Pot Lunch Crock Food Warmer – How handy is this little guy. There’s no need to use the microwave when you can heat up your lunch with this crock. 12. Crock-Pot Electric Gravy Warmer – You won’t have to worry about serving cold gravy with this crock. 13. Crock-Pot Whiteboard Crock Skin – Let guests know what you’re serving with this skin. This magnetic skin wipes clean easily. 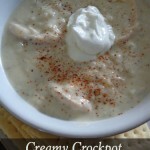 Check here to see if the crock skin is available for your slow cooker. 14. Covermates – If you’re cabinets are full and your crock’s home is on the countertop you can pretty up your counterspace with a cover. 15. Slow Cooker Digital Probe Thermometer – Solve the problem of wondering whether your meat is ready or not with a meat thermometer. It’s also perfect if you tend to overcook your meat. 16. 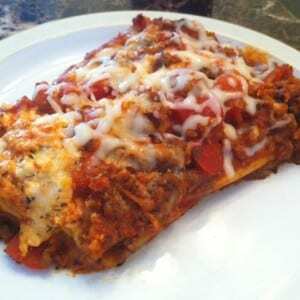 Slow Cooker Liners – Clean up will be a breeze with these liners. 17. 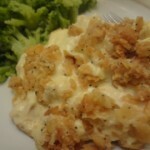 Crockpot Cookbooks – What good is a crockpot if you don’t have any yummy recipes to fill it with? You’re going to love these cookbooks. 18. McCormick Spices – With flavors like savory pot roast, hearty beef stew and more, you just can’t go wrong. 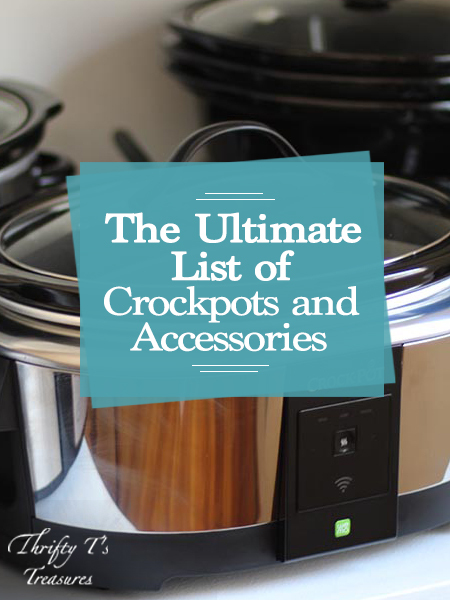 And there you have it, my ultimate list of crockpots and accessories! 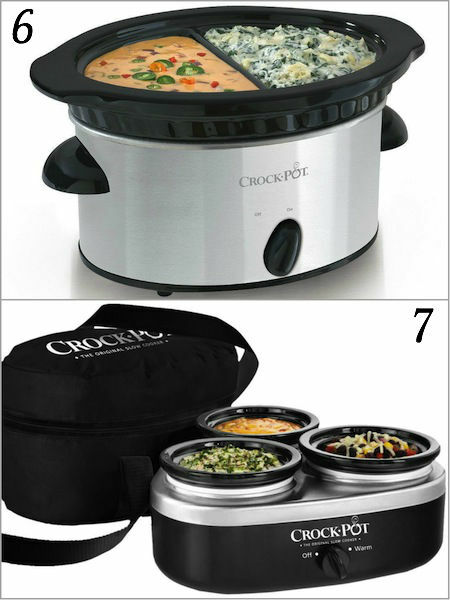 Which crockpot or accessory is your favorite? Who knew there were so many different crock pots. I love the gravy warmer, I could really use that one around the holidays. 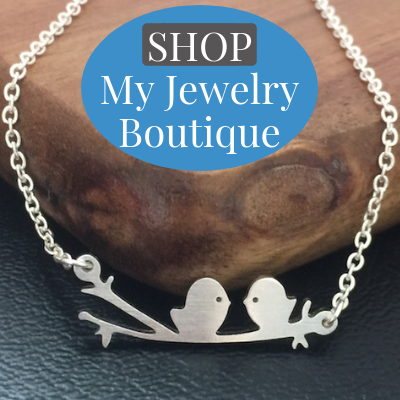 Yes, that would be a great one to have at the holidays!